Passive recoveries are sometimes the simplest way to recover a vehicle, and often overlooked. People are quick to grab a strap and hook up to another vehicle without understanding that a few shovels of dirt could allow the vehicle to drive out safely under it’s own power. There are a few passive methods, but almost all require the vehicle to be lifted in some fashion. I personally use a hi-lift, but some people have had luck using an alternative such as the ARB X-Jack. Since I have not used these alternatives, I will not specifically touch on it here, although many of the same methods and concerns should be exercised. Always read the manual before using a product. Passive recoveries are often the most direct solution to the problem of spinning tires. A tire spins because it either doesn’t have enough traction (on sand or mud) or doesn’t have enough weight on the tire (high centering). Hi-Lift: A standard hi-lift recovery is one of the most basic, but also potentially one of the most dangerous for the user. A hi-lift recovery is perfect for a situation where the ground is relatively level and the frame is slightly hung on a rock or stump, or has sunk down to the ground. The hi-lift’s primary operation is lifting, which is exactly what is needed in these situations. The plan would be to lift the vehicle off of the obstacle. While the vehicle is in the air, we would then utilize a shovel or some rocks to fill the area under the tires. Then the vehicle’s tires are lowered onto the fresh dirt or rocks in order to keep the frame off of the obstacle, and drive forward. An alternative to adding dirt below the tires can be simply digging the dirt out from under the frame. In the end, it produces a similar result. When lifting with the jack, support the jack’s main H-beam with one hand until there are about two-to-three clicks of load on the lifting mechanism. At that point the user can allow the vehicle’s weight to hold the jack vertical. Try to ensure that the jack is as vertical as possible when lifting the vehicle; otherwise you will be exerting a side load on your vehicle, which could potentially lead to an unstable vehicle. It is important to remember that the hi-lift is an inherently unstable tool. The base is not wide, which easily allows the jack to lean, or kick out when under load. The only way to prevent this is to ensure the vehicle is properly restrained. If you plan to lift the entire front end off the ground, engage your e-brake, locker, and chock the tires as necessary. If you are lifting the rear end, ensure that the front tires are chocked, or possibly have someone sit in the driver’s seat with their foot firmly on the brakes. If you are lifting at a rock slider, and are lifting an entire side off the ground, engage the e-brake, locker, and chock as necessary. Use common sense. When lifting the body or frame, it should be noted that you will be lifting the body first, then the suspension. Because of this, it can sometimes be easier to lift directly from the wheels. This can be done by using the lift-mate. This accessory attaches over the lifting tongue of the jack and hooks to the wheel spokes. This is especially handy when the vehicle does not have steel bumpers or rock sliders. If you are using the hi-lift on soft soil or mud, it is handy to have the off-road base. This does not increase the stability of the jack at all. It prevents the jack’s foot-plate from sinking into the muck as deep by spreading the load over a larger area. 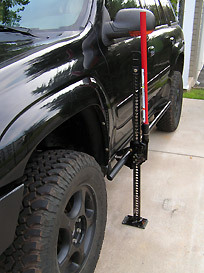 A special use for the hi-lift actually utilizes the unstable nature of the hi-lift jack. 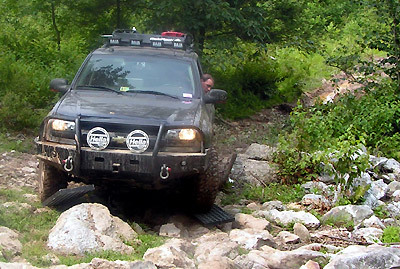 This procedure can be especially helpful for getting a vehicle out of deep ruts. The key here is to lift the vehicle’s wheels out of the ruts with the hi-ligt, and then push the vehicle sideways. This method essentially ‘pole vaults’ the vehicle onto higher or more solid ground. Just remember to keep a foot on the bottom of the hi-lift to prevent it from kicking out. Overall, the hi-lift has become a staple of off road travel because it is a simple tool that performs a simple function, and has done it well for many years. Before needing to use the hi-lift, practice with it, and learn to respect its instability. Remember to never climb under the truck with the hi-lift holding it up. When the vehicle’s weight is on the jack, always assume that the vehicle is unstable. If possible, someone should always maintain contact with the jack to help prevent it from kicking out. Bridging Ladders / Sand Ladders: There is a subtle, but important difference between sand ladders and bridging ladders. Bridging ladders can support the weight of the vehicle and span a distance equal to the length of the ladder. Sand ladders are not made to support the weight of a vehicle. Sand ladders are made as a traction adder and load spreader only. While a sand ladder cannot be used as a bridging ladder, a bridging ladder can be used as a sand ladder. Make sure you understand which product you have, and only use it in the proper manner. Sand ladders are useful in muddy or sandy environments where flotation is key. Sand ladders can be used in conjunction with a hi-lift or they can be used independently. This often is determined by how quickly you realize you will need them. If you are already bogged down to the frame, you will likely need the lift in order to place the ladder under the tires. If you can merely not proceed forward, it can be a simple solution to back up a bit, insert the ladder, and proceed forward again and drive over the ladder. Another alternative to lifting the vehicle can be simply digging out the soil from in front of the tire, and inserting the ladder. Often the vehicle can climb right out of it’s ruts and onto the ladder. Another helpful item can be a piece of carpet, this can be used as a load spreading device similar to a sand ladder. If you don’t carry a load spreader of some kind, branches or brushwood can be used as an alternative. A bridging ladder can be used in many situations as an alternative to approach angle or in lieu of larger tires. Suppose you are confronted with a two foot rock step, and you have 32” tires. You could attempt to edge into the step with one tire, and slowly apply power until that tire pops up and over the step. However, the easier alternative is to prop the bridging ladder on the step, and drive straight up. While this can put you in a precarious position, it can often provide a much simpler and safer approach to a difficult obstacle, while putting less stresses on the vehicle. It is important to remember that these can kick out once the front wheels pass over. Keep this in mind and ensure they are properly positioned before proceeding over them with the rear wheels.